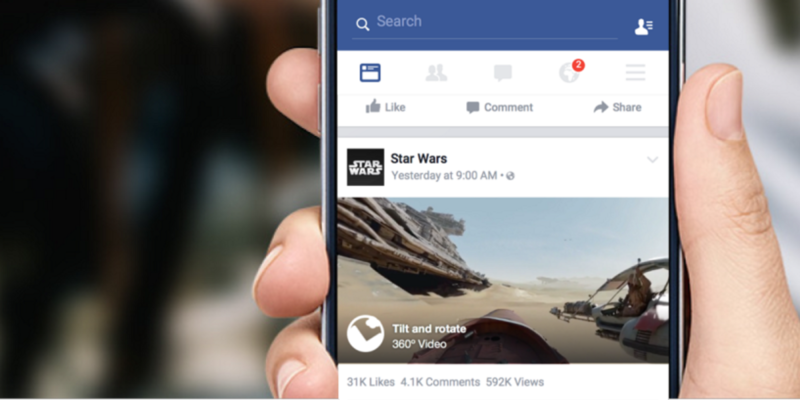 Facebook videos are about to get more immersive: the News Feed now supports 360-degree video. The new feature is available on both mobile devices and the desktop, and works similarly to YouTube’s implementation. On mobile devices, you can simply move your phone to look around the video (or tap and drag). On the desktop, you click and drag with your mouse. That said, the announcement isn’t unexpected. Facebook announced spherical videos were coming at its F8 conference earlier this year, and it was only a matter of time after it bought Oculus last year anyway. It’s also another sign of how serious the company is taking video now, having recently implemented other features such as pop-out video, and trying harder to remove copyrighted content from your News Feeds. There are already a few immersive videos available, including a clip from Star Wars: The Force Awakens (!) as well as content Discovery, GoPro, LeBron James & Uninterrupted, Saturday Night Live, and VICE. The company says the new video format will be available on the Web and Android ‘soon’ (it already works for us). It’s not available on Safari or Internet explorer, however, and iOS users will have to wait a few months before they can waved their phones around in the air to look through videos. For more on the new feature, check out Facebook’s demo video, or read through Facebook’s support page here.